The main reason to use group variables in Reporting Services is to speed up processing. This is best illustrated by an example. Translation note: a "film" is just a movie shown in the UK! For each director you can see the films they've made, together with statistics on how many Oscar nominations each film they made received. That is: if the total number of Oscar nominations for this director is zero, just display zero; otherwise, divide the number of nominations for this film by the total number of nominations for the director. The above expression would work perfectly, but would mean that the group total number of nominations was calculated twice for every film. There must be a quicker way! 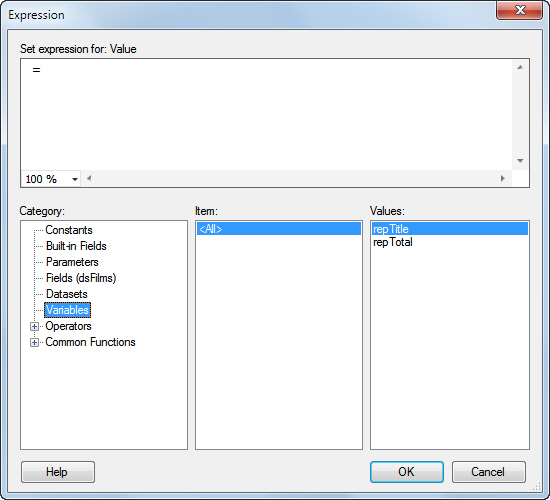 You can create this variable as shown in the previous part of this blog. This will sum the number of nominations across the entire dataset (here called dsFilms). For how to create the group variable - read on! There are many ways to do this: one way is to right-click on the group in the grouping pane and choose to show its properties. 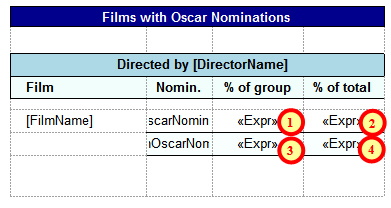 Because this is a group variable, it will automatically calculate the total of Oscar nominations for that group (so the scope doesn't need specifying further). The expressons for each of the 4 textboxes shown here are given below. The Variables category only lists report variables, not group ones. When you reference the collection of Variables, you still can't see the group ones. We called our group variable GroupTotal. This irritating "feature" seems to exist only in SQL Server Data Tools in Reporting Services 2012 (2008 R2 doesn't seem to have the bug). Select the wrong name ... ... and correct it. Ignore the red underlining - this is a valid expression! You can now continue to create all of the expressions shown for boxes 1-4 above, and for your efforts get a much more efficient report.